This Exped SynMat 9 review is about an insulated inflatable sleeping pad with a built-in pump and microfiber insulation that gives it R-value 6 and makes it suitable for year-round use. This is a patented design and they build in in two sizes. This SynMat 9 pad is available on Amazon and I have seen it on several of their stores worldwide. So if you follow the link you can order it from your local Amazon store and save on shipping. In the EU you can also find it at Bol.com, they have a very efficient shipping service. 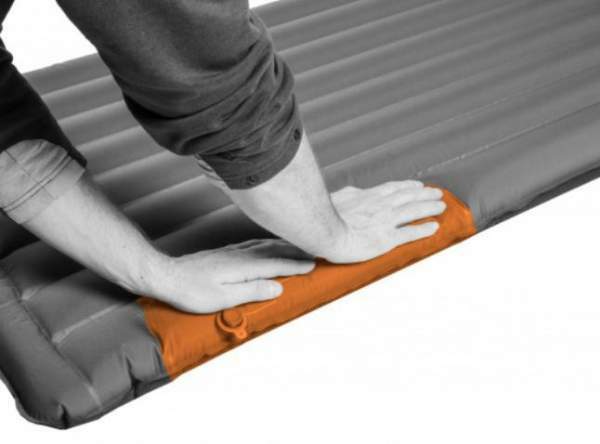 Exped SynMat 9 sleeping pad top view. If you are familiar with Exped brand then you know that they have many sleeping pads on the market. Those from the SynMat series are in this orange/terracotta color which you see in this pad. So do not get lost, they are all different, you can have different fills for insulation, or they may be without it, and they are of different thickness, etc. The number 9 in the name here describes how thick this pad is in centimeters. They use a baffled air chambers construction and the pad gives a plush 3.5 inches of comfort between you and the ground. This should be enough even if you are a side sleeper. They use a layer of microfiber insulation which is laminated to the bottom and top of each baffled air chamber so it stay in place and provides a consistent insulation. This is a 200 g/m² Texpedloft microfibre, bluesign certified. The effective R-value is 6 and this is equivalent to the temperatures as low as – 25 C (- 13 F). See below how it looks in the cross-section. The fabric is strong and it offers both UV and abrasion resistance. On the top you have 75D polyester, micro brushed, with a TPU polyether film laminate, hydrolysis resistant, honeycomb embossed, and it is Oeko-Tex 100 certified. The only difference on the bottom is that it is not micro brushed. This is how the integrated pump works. Medium 72 x 20.5 inches (183 x 52 cm). Long/Wide 77.6 x 25.6 inches (197 x 65 cm). So the LW version offers lots of space to sprawl out, the M version is more suitable for shorter people to avoid carrying unnecessary weight. Seasons-wise, you have already seen its R-value so the pad is obviously suitable for 4-season use for most of the situations except for the extreme cold. Weight-wise, you will see in the comparison table below how it compares with some ultra light and light insulated pads. So it is light enough for hikers and backpackers. The packed size is also excellent for an insulated pad. Size-wise, clearly the M version is not for tall people. So if you are one of them you will have to choose the LW version, but it is a bit heavier. The pump adds some bulk but it is worth it. This rating is for the M size. – M: 2.02 lb (915 g). – L/W: 2.55 lb (1155 g). Temperature rating: – 25 C (- 13 F). Thickness: 3.5 in (9 cm). – M: 8.7 x 6.7 in (22 x 17 cm). – L/W: 10.6 x 6.3 in (27 x 16 cm). The table below may give you some idea of how this pad stands when compared with some other similar pads from top brands. So I give two of them side by side. One is ultra-light, just to give you some idea what you can find on the market. As you see the packed size and the weight of this SynMat 9 pad are really good and the same holds for the price. This may be surprising because Exped’s pads are usually not so affordable, while Klymit’s pads are typically without a match regarding the price/value combination. This Exped SynMat 9 Inflatable Sleeping Pad provides comfort, low weight, and durability for all year use at a really good price. The integrated pump is a great feature which saves the pad from moisture accumulation over time. It adds weight and bulk but this is a great feature. The materials are durable and you have realized this from the comparison table above, this also reflects in the weight of the pad. The warranty which they offer is exceptional for such an item. Please note that I am not paid by the manufacturer and this is not a sponsored text. If you need more pads to check, please visit my page with sleeping pads. You will see many pads from this brand. Thank you for reading. Please share this text if you find it useful. There is a comment box below so use it in the case of questions. Have a nice day.